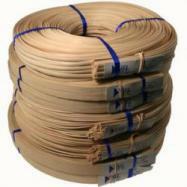 Yes, we have ALL SIZES of reed IN STOCK. No Back Orders! We're proud to offer our customers Superior Quality Basket Weaving and Seat Weaving Supplies at Reasonable Prices. All of our reed is p remium, precision cut from the core of the rattan vine. You'll never find "seconds" or "slightly hairy" for sale at V. I . Reed & Cane Inc.
11/64 flat reed - 420 ft.
3/16 flat reed - 400 ft.
1/4 flat reed - 350 ft.
1/2 flat reed - 160 ft.
5/8 flat reed - 140 ft.
7/8 flat reed - 100 ft.
3/8 flat oval reed - 171 ft.
5/8 flat oval reed - 66 ft.